Locking a door with a simple Yale or Chubb is largely a thing of the past thanks to the many startups that have brought smart systems into play. Joining the party today is an intriguing product that takes your standard deadbolt lock and allows you to unlock using only your smartphone – iPhone and Android, both. Known as Sesame, it costs just 99 bucks, and while the pricing is reasonable, the fact that it integrates with your current setup is the real clincher. Having fanciful products to offer the consumer market is one thing, but to bring something to the table that can be seamlessly applied to a system found in every household gives it a real chance of succeeding. 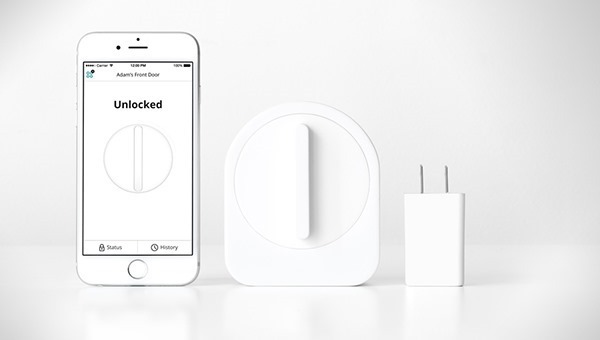 Currently hovering on Kickstarter, it consists of a small contraption that attaches to your deadbolt, installing "in seconds," which can then connect to your iPhone / Android via Bluetooth. With a Wi-Fi Access Point accessory also available, users can also remotely lock their deadbolts should they so wish, and for such a low price, it could really undercut competitors. For those really keen, it’s in Kickstarter as an early bird special for $89, and while it’s undoubtedly a cool product, it also enhances security to have remote control of locks in such a manner. Sesame only underlines the notion that smart home products are here to stay. Apple’s introduction of HomeKit is a further testament to this movement, and while the Cupertino hasn’t brought forth any of his own hardware in this area, there’s still plenty of scope for products like Sesame to flourish. Since the Wi-Fi add-on is optional, it does cost more, but if you just want a convenient way to unlock a deadbolt without rootling around for keys, then the $89 version has you more than covered. Personally, I think this is a great little product, and would enhance the security of any homeowner rocking an iPhone or Android device. In the meantime, check out the demo video, and as ever, do leave your thoughts and comments below.